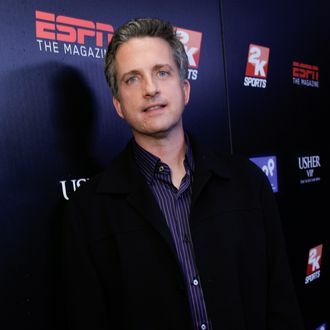 It sure looks like there’s still some soreness between ESPN fixture and Grantland editor Bill Simmons and his employer. Barely three weeks after returning from a suspension for calling Roger Goodell a “liar” and daring his bosses to punish him for it, Simmons is going after his colleagues on the very Twitter account he was banned by the company from using during his three-week unpaid vacation. Bill Simmons Is Back. Here’s How He Spent His Suspension From ESPN. Have the balls to call me to discuss it on the show. Don't pull it out of context just because you need fodder for a segment. Pathetic.